CarGurus has 14,357 nationwide X5 listings starting at $2,199. For 2013 BMW is leaving its (arguably) niche-topping X5 midsize crossover SUV pretty much alone. That’s because this 5- to 7-passenger 4-door Sports Activity Vehicle (as Beemer enchantingly designates its entire crossover lineup) is anticipated to don its next-gen garb for the 2014 model year. This naturally leaves potential buyers in the somewhat awkward position of pondering a soon-to-be-bygone trim, or waiting a year for the upgraded version. For those who’d rather not dally, expect the 2013 trims to remain the base xDrive35i, the turbo-diesel xDrive35d, the agile xDrive35i Sport Activity, the uber-luxurious xDrive35i Premium and the V8-powered xDrive50i. All trims, of course, come with standard xDrive “intelligent” all-wheel drive (AWD), not to mention plenty of standard luxury features, nimble handling and turbocharged power in both diesel and gasoline-burning versions. Dimensions will carry over from 2012 as well, thus cargo capacity remains 75.2 cubic feet in all trims, with the rear seats folded. Towing capacity, by the way, remains maxed out at 6,000 pounds with proper equipment. For some reasonably priced alternatives until the next-gen X5 comes out, tire kickers might want to check out the Acura RDX, Infiniti FX and the Land Rover LR4. Additionally, Mercedes-Benz is expected to offer its reworked M-Class in late spring, while Porsche’s Cayenne offers significantly improved ride and performance over just about everything, but is, alas, considerably more expensive. 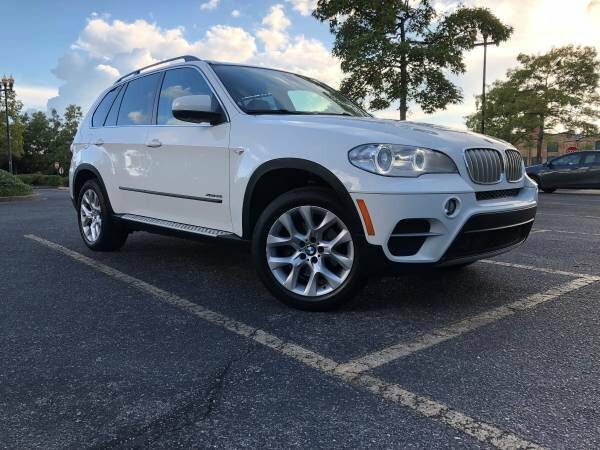 In any case, those poised to pounce on the 2013 X5 can look for the traditional choice of three engines, starting with the gasoline-burning direct-injected (DI) 3.0-liter turbocharged inline 6-cylinder (I6) powerplant found in the xDrive35i variants. Mated with a shiftable 8-speed transmission, the six-banger is capable of 300 hp and 300 lb-ft of torque, and, with variable valve timing (VVT), is EPA-rated at 16 mpg city/23 highway burning the required premium unleaded. The xDrive50i, meanwhile, sports a twin-turbo DI 4.4-liter V8 powerplant that again mates with the 8-speed shiftable automatic for 400 hp and 450 lb-ft of torque. Despite VVT, look for an EPA-estimated 14/20 from the hard-charging V8. The xDrive35d, on the other hand, boasts an economical yet adequately potent 3.0-liter turbodiesel I6 that’ll throw down 265 hp and 425 lb-ft of torque with its standard 6-speed shiftable automatic. Expect a heady 19/26 from the blown diesel. Beemer’s highly touted xDrive AWD system is managed by a mechanical center limited-slip differential and channels most torque to the rear wheels in normal driving, instantly transferring power from the wheels that slip to the wheels that grip, front and rear. Historically, Beemers revel in their luxury endowments, and the X5 is no exception. The 2013 xDrive35i and 35d variations, for instance, are slated to retain their standard 18-inch alloy wheels, roof rack, power-opening rear liftgate and heated power-adjustable mirrors outside, while cabins should remain adorned with alloy and leather accents, leatherette upholstery, power-adjustable front bucket seats, remote power door locks and power windows inside. Also look for the return of standard cruise control, telescoping tilt-wheel steering, front and rear parking sensors, dual-zone climate control and driver memory settings. Entertainment, meanwhile, should once more be provided via a 205-watt system with 10 speakers, a single-CD player and USB connection. Bluetooth-enabled BMW Assist directions and connections technology will likely return as standard equipment, also. The xDrive35i Sport Activity trim, meantime, is expected to again feature a standard sport-tuned suspension, 20-inch alloy wheels, sport front seats and steering wheel, darker exterior trim and a higher top-end speed. 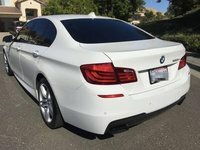 Moving up to the xDrive35i Premium ought to once again beget 19-inch alloy wheels, a power sunroof, premium leather upholstery and genuine wood trim added to the various cabin accent materials. Finally, the xDrive50i boasts all the other stuff, plus standard hard-drive-based navigation and a 600-watt, 16-speaker premium audio system, with the 35i Sport Activity’s upgraded suspension, wheels and sport-oriented accoutrements offered as an available option. Look for the base-level xDrive35i and 35d to become eligible for much of the bling found standard on the higher trims. Those same higher trims, moreover, can be further equipped with such available goodies as rear-seat entertainment, BMW Apps for iPod/iPhone, a head-up windshield display, heated rear seats and heated steering wheel, multi-contour front seating and active cruise control as either standalone equipment or included with various packages. Additionally, each of the X5’s three higher trims can be equipped with available Adaptive Drive performance-enhancing technology, including Active Steering. Finally, third-row seating for a total of 7 passengers is available to all trims. In keeping with BMW's traditionally lofty safety standards, look for all 2013 X5 trims to be equipped with 4-wheel antilock brakes, traction and stability control, front and rear head airbags, front side-mounted airbags and active front headrests. Further safety items should include daytime running lights, front fog/driving lights, self-leveling high-intensity-discharge headlights and a post-collision safety system that includes BMW Assist emergency services. Lastly, a lane departure warning system is expected to once more become available in all trims. What's your take on the 2013 BMW X5? 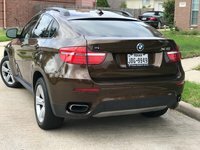 Akaej47 My X5 has only 27k miles and I bought it brand new. It’s been one thing after another. I was left stranded by the side of the road because it overheated. My wiper fluid does not function. And the tires are made of paper. I don’t drive it more then 20 miles a week. Now I have a Emergency parking light malfunction..what ever this means. Users ranked 2013 BMW X5 against other cars which they drove/owned. Each ranking was based on 9 categories. Here is the summary of top rankings. Have you driven a 2013 BMW X5? Why is CarGurus hiding my number. I need to speak to the seller!!!!! How am I going to buy with no fucken contact. This site is so dumb. How can Brandon Dodge post a picture of an un damaged BMW X5 in an attempt to sell a wrecked X5?